Pete Berthelsen is a renowned wildlife conservationist and pollinator habitat expert. 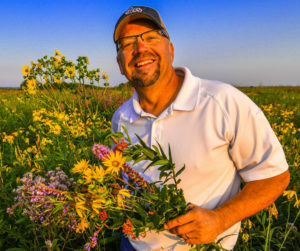 As the President of Conservation Blueprint, he offers a wide range of experience, seed mixes and services to those wanting to plan, create, and maintain helpful wildlife and pollinator habitats. Conservation Blueprint creates custom seed mixes available for purchase, and can assist with project design or habitat consultations. Whether you’re interested in a honey bee mix for Iowa, a custom designed pollinator habitat plan in Michigan or anywhere else in the country, we can help you create a friendly plan to meet your objectives. Pete Berthelsen is a renowned wildlife conservationist. As the President of Conservation Blueprint, he offers a wide range of mixes and services to those wanting to plan, create, and maintain helpful wildlife and pollinator habitats. Conservation Blueprint creates custom seed mixes available for purchase, and can assist with project design or habitat consultations. Whether you’re interested in a honey bee mix for in Iowa, a custom designed pollinator habitat plan in Michigan or anywhere else in the country, we can help you create a friendly plan to meet your objectives. Copyright © Conservation Blueprint, 2018. All Rights Reserved.